NRL GRAND FINAL SCORE: Melbourne Storm 23 (Hoffman, Blair, Inglis, Slater; Smith 3/4, Inglis 1 FG) defeated Parramatta Eels 16 (Grothe, Reddy, MoiMoi; Burt 2/3) @ ANZ Stadium, Sydney. 2 The #NRL Finals Tweet will have our in-game update service running throughout the Storm v Eels Decider. 4 The rain is still hovering around... this will not be a dry #NRL Grand Final. Still liking the Storm. 5 The lounge room votes are in... Game Result: Eels 2 votes, Storm 3 votes. 7 #NRL Grand Final Votes Pre-Game - 1st Tryscorer: Inglis, Turner, Burt, Slater. Clive Churchill: Cameron Smith, MoiMoi, Slater, Finch. 8 Just minutes away... the phone will be turned off for the next few days if Parra win, to avoid those annoying Parra fans. GO STORM! 13 Storm kick-off... MoiMoi crushed by Johnson! 15 Cronk's cross kick is taken beautifully by Grothe just outside his own tryline. Good start by the Storm. 16 Turner gets a roll on from dummy half... Storm back into Eels territory for 2nd set in a row. 18 HOFFMAN IS IN! He's crying! 19 Easy easy try... there goes the vaunted Parramatta defence. Finch short ball to Hoffman who runs 20m to score. 20 Smith to try and convert from about 10m in from the left sideline. It's good, sneaks inside the right upright. MELBOURNE 6-0 after 6mins. 21 Robson and Reddy exposed by the quality of the Finch short ball. 22 INU knocks on... first mistake. 23 Storm get another crack at the Eels inside their half. Parra under pressure. 24 Hoffman almost goes in again from a Finch short ball... Hoffman tried to off-load but his pass goes to ground. Reddy picks it up. 25 News from the sheds... Jarryd Hayne left one of his boots at home... genius huh? 27 Hayne injects himself... chip over the top but it goes dead in goal. Storm 20m restart. 28 10th minute... Storm still 6-0 up. 30 Slater dancing through the defence on a kick-return. Turner keeps the metres coming from dummy half. 31 Inu lies down after copping a slap across the cheek when he caught an Inglis bomb. Barely touched him... tissue Krisnan? 32 Mortimer tries a little chip back across the play the ball from 15m out. Burt can't hold it and stay infield. Storm ball. 33 15th minute - Storm still 6-0 up but Eels back in the contest. 34 Lima into the game for White. 35 Turner with a great mark in goal. Robson kicked it in behind the winger once again and Turner is equal to it. 36 40/20 attempt by Smith... Hayne brings it back and Lima doesn't miss. 37 Slater makes a run across field from the kick-return. Making good metres. For some reason Parra are targeting Turner rather than Nielsen. 38 Tandy Electronics is into the game. 39 Almost a quarter of the way through the game... what does Daniel Anderson have planned for the half time tape recording? 40 News from Sterlo - Hindy has 23 tackles in the first 20 minutes. Storm still lead 6-0. 41 Grother does another fine job defusing the Cronk kick. Grothe gets it back out to the 20. 42 MoiMoi replaced by Galuvao. 44 Hayne with his first real shot of the contest... Parra making a good return in this set. Cayless off after 20 minutes. 45 Inu made a great catch on a bomb above Slater but his offload couldn't be held by Galuvao. Storm get a penalty. Johnson looking sick. 46 ADAM BLAIR IS IN! 47 Finch changed side of the field to Cronk, who dummied to Slater split the defence, drew Hayne and Blair races over! 48 Smith for the conversion and a 12-0 lead. What a great play by Cronk. 49 Mannah and Lowrie split way to easily. Both two Storm tries have been relatively soft in regards to the Eels defence. 50 Smith missed the kick. After 26 minutes it's 10-0 to the Storm. 52 Lima with the ball playing skills... Tandy almost through. 53 Inglis tried a chip but gets leveled by Lowrie. 54 Sorry gets leveled by Ben Smith. 56 Mortimer gets through! Eels press! 57 Hayne almost put Reddy through but a fantastic tackle by Nielsen. Hayne tried a DUMB cross kick with numbers left... shocker. 58 From across the room 'Parra's last tackle plays have been appalling." 59 Some sloppy work in that Storm set but Cronk kicks it over the line, smartly. 60 Penalty to the Eels... Tony Archer gets himself on TV. 61 32nd minute - Melbourne 10-0. 62 Key set for the Eels. At worst need a repeat set from 20m out. 63 Forward pass called by Hayne. It was so good call. Reddy to Grothe... young Eric looked set to score but the pass was forward. 64 Vince Noir is not well... Joel Reddy for those who haven't been told of the similarity yet. 65 35th minute - Storm 10-0. But the Storm look tired. 67 Inglis with a crucial tackle on a Hayne kick-return. 68 Hindmarsh with 31 tackles, Johnson next best with 22. 69 Cronk tried to steal a few more metres before kicking but Hindmarsh puts a huge push on him and no last tackle play for the Storm 20m out. 70 Mateo announces himself with a great offload to Inu. Eels moving up the field again! 71 Hindmarsh knocks on in the play the ball. But Gus still loves him. 72 90 seconds to halftime. Storm set from halfway... Field Goal? 73 Slater and Blair combine down the left but Cronk's pass goes forward. Wasted chance at a field goal there. 30 seconds to HT. 74 Wow... Eels with one last chance before halftime and he kicks the ball over the sideline from halfway... what was he doing there? 75 #NRL GRAND FINAL HALFTIME SCORE: Melbourne Storm 10 (R Hoffman, A Blair tries, C Smith 1/2 Goals) lead Parramatta Eels 0. 77 So who wins the 2009 #NRL Grand Final from here? Storm leading by 10 at the break. 78 Do Channel Nine have no shame??? Hey Hey host Daryl Summers hijacks the Grand Final telecast to showcase his botox. 81 Eels coming back after halftime... Rabs is talking up their chances like a good Parra fan. 82 Storm will receive the kick-off to start the second half. 83 Joel Reddy hooked? He's on the bench to start the half. 84 Storm get an early penalty. Into the Parra half already. 85 GREAT HIT! MoiMoi on White. Whiplash! 86 Wow... Storm go right and Slater tries a bit too hard... throws it over the sideline. 87 Where's Billy? Asks Jarryd Hayne.... great step by the Storm fullback to beat the Eels superstar. 88 Mateo breaks up the left! 89 Robson holds the play up... Keating to Mateo... offload to Burt... to Robson! 90 Stopped just short... Grothe out wide!!! TRY! 91 Grothe runs over Slater to score Parra's first try in the 45th minute! Here come the Eels! 92 Grothe had a lot of work to do on his right sideline... but beat a few players and crashes over!. Parra needed that! 93 Burt with a big kick. Gets this and the Eels could take the lead with another try. He gets it. 94 46th Minute - Melbourne 10-6. 96 Important five minutes or so here for the Storm. Need to stay with their game plan in the face of this Parra surge. 97 MoiMoi gets Johnson! with a corker. 100 Cronk puts it high, Grothe and Hayne found wanting but Inglis races through takes it easily and SCORES! 101 Smith will make it an immediate strike back. Converts and Melbourne 16-6. 102 51st Minute - Melbourne 16-6 after Inglis takes a Cronk bomb to score under the posts. 103 Huge play by the Storm. The game just shifted once again. 104 Chambers does his turnstile impersonation... Galuvao into space! 105 Reddy pulled down on the last tackle... 5m out. Good defence Melbourne. 106 Mateo is looking dangerous but there's the error trying to force the off-load, helps if you've got players supporting you, not your fault. 107 Hit him MoiMoi! White is such a pretender. 108 MoiMoi again! Anderson gets clocked. 110 That's not a typo.... Slater is over! 111 Cronk to Blair who broke through and found Slater who SCORES! The Storm are out to 22-6 after 56 mins. 113 TACKLE! Turner on Burt down the left touchline. Great play. 114 Good option for the Eels but Turner was there to make the tackle. Burt into touch. 115 60th Minute - Melbourne 22-6. 116 Hindmarsh goes past 50 tackles... Flop count close to 20 though... still he's such a great player, shame the Storm are 16 in front. 117 Slater defuses another dangerous bomb. 118 Hayne has been hurt on his kick-returns all game. But he's been far better this half. 119 Great offload by Cayless... Eels need something soon. 121 That's terrible.... Robson at halfway gets rushed on the kick... and finds touch 40m out... from the halfway line. 122 65th minute - Melbourne 22-6. 123 Time is definitely not on Parramatta's side now. 124 Inglis injects himself beats Ben Smith... tries to reach Finch back on the inside but it gets toed through by Finch... Eels to drop out. 125 Eels go for short drop out... Chambers shows his IQ by touching it before the 10m line... Penalty Parra... well done scoop. 126 Adam Blair stops Hayne on one of those danger runs. Good tackle. 127 Mateo knocks on again... but penalty for not straight markers. Parra MUST score in this set. 128 68th Minute - Storm 22-6. 129 Inu tried to put Burt over but Turner gets in the way. Another set for Parra but Turner stopped a try. 130 Rabs just asked Sterlo 'Why are you always right?' - easy answer Rabs - They watch the game! 131 Twitter held up updates after reaching a limit I had no knowledge of. We've covered the final 12 minutes will update later. Well Done Storm! 132 So we had the game heavily covered by the 68th minute... then Twitter killed us! Updates above were written live but updated to Twitter 2 hours late - through no fault of our own. 133 At the risk of overloading the Tweet again... here are the updates as recorded during the final 12 minutes. Apologies it wasn't our fault! 134 Reddy Scores! From a Robson kick! Burt converts. Melbourne 22-12. 135 Here come the Eels! Razzle Dazzle stuff! 136 70th Minute - Storm 22-12. 137 OH MY GOODNESS! MoiMoi has run 85 metres to score! Ok 20 but he's run over 3 or 4 defenders to score. 138 WOW! Eels back in it! Turner and Slater have tried to stop MoiMoi but he's been given the try via the Video Referee! 139 72nd Minute - Melbourne 22-16 with the kick to come! Mateo off-load to MoiMoi and the big unit runs over everyone! 140 Missed the kick! 73 minutes gone and the Eels are racing home! Down by 6 with 7 minutes to go! 141 Big set for the Eels to get out of their own half. The game has come alive! 142 Huge Hoffman tackle on Mortimer. Last tackle - Hayne goes to the air! Knock on Slater! Here's the Eels chance! 143 From the scrum… Eels on the verge of something amazing! Chambers stops Inu - had to be made that. 144 Todd Lowrie has a brain explosion… kicks straight to Cameron Smith! Hayne needed the ball! Wow… what a waste. 145 Storm looking dead though… must find touch. Slater great run. Gets a penalty! MoiMoi in the play the ball… huge call by Archer. 146 Slater loses it but MoiMoi had not let go when he had to… still that'll be the call Parra fans blow up about. 149 Wonky as… but it's over! 150 Inglis kills the Eels! YEEHAAA!!! 78th Minute - Melbourne 23-16. 151 Reddy tries to hold onto the short kick off… knocks it on. 152 Cronk finds touch, slows it down. Game is over. With 90 seconds left… Eels will keep at it but are out of it. 153 Storm 23-16 with a minute left. Knock on Melbourne after a Mateo offload. Only hope for the Eels is an 8 point try… not gonna happen. 154 Melbourne deserve to win this. And they will… 2 Premierships in 4 years… well done. 155 Interesting… Hayne knock on in the final 20 seconds… the star couldn't pull the win off when it ultimately mattered. Still what a year. 156 STORM WIN!!! The Melbourne Storm are the 2009 NRL Premiers! 158 #NRL GRAND FINAL FT BEST: Cronk, Smith, Hoffman, Inglis, Hindmarsh, Slater, MoiMoi, Lima, Blair, Johnson, Turner, Mateo, Cayless, Grothe. 159 Billy Slater gets the Clive Churchill Winner… questionable. He was great but there were a few players who were better. Like 3 or 4. 160 Clive Churchill Medal that is, even Slater acknowledged Cronk was the best on ground. 161 Cayless to speak on behalf of the Eels. Enjoyable ride the sentiment. 162 Here comes Cameron Smith to accept the Premiership Trophy. 163 Cameron Smith lifts the trophy high with a real sense of relief on his face. 164 Eels players doing a 'lap of honour' while the Storm captain does his acceptance speech… pathetic. 165 What a great Grand Final. No fairytale for the Eels but the Storm did deserve to win. 166 Love the Nathan Hindmarsh interview… asked what the Eels boys said in the huddle post-match… he said - "Don't know, wasn't listening." 167 That'll do us, thanks for following NRL Finals Tweet through the Finals. We will continue to operate through the off-season with NRL News. 168 @LisaahAurelia You're welcome - pity about Twitter killing the feed with 12 minutes left! 169 The #NRL Finals Tweet has selected Cooper Cronk as our Player of the 2009 Grand Final. Outstanding performance at halfback. 171 Reading Bob McCarthy's reasoning for picking Slater ahead of Cronk was hilarious. Yes Slater was great, but Cronk was the difference maker. 172 Daniel Mortimer post-Grand Final: "We've learned a lot about what it takes to win a grand final..." umm how so? Didn't Melbourne win it? 174 #NRL Finals 2009 is now The NRL Tweet - the Finals are over, Melbourne are the 2009 Premiers but our coverage of Rugby League will continue! The best way to follow the 2009 Finals Series was via NRL_Finals_2009 on Twitter We produced 900+ Tweets - with some great nuggets of information in there, as well as news as it breaks. For the games themselves, regular Tweets will be uploaded giving you an instant evaluation of how the game is being played out and what to watch out for during the match. You can check out the In-Game Tweets within the Game Reports from all Semi Finals - just click on the linked articles on the drop down archive menu on the right of this page. 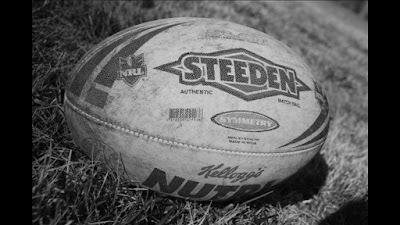 The NRL Tweet will continue during the off-season so sign up. IN 2009 THAT WAS THE MELBOURNE STORM!